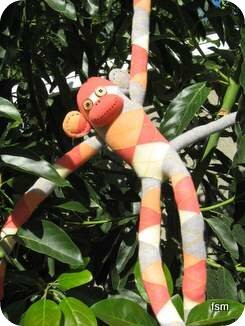 Women's long argyle knee high socks were used to make this tall spunky sock monkey. 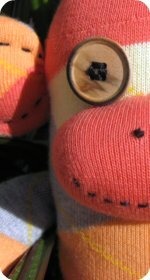 Argyle socks are great for making stuffed monkeys, especially nice bright colorful ones, they come out quite cute. Step one: You will need argyle socks. 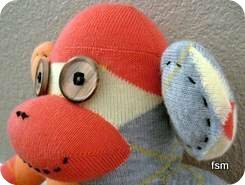 But, sew and stuff your monkeys body, arms, legs and mouth using the basic sock monkey pattern and instructions. 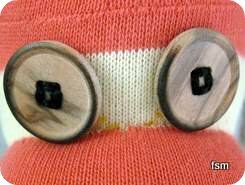 Eyes: Wooden button eyes with four holes were used. They were stitched on by creating a square in the center of the buttons as opposed to an X. 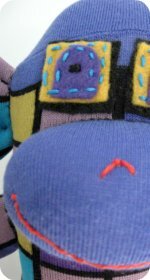 Ears: The ears were embroidered the same way as the mouth (with the spaces). 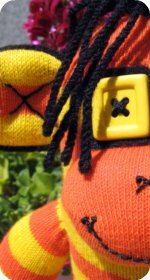 When pulling the threads through, don't pull them too tight or the ears will gather up. 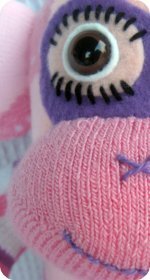 By keeping the stitches loose they stay very visible. Tail: I cut a long tail from the gray sock. I chose gray for the tail as it is one of the colors in the argyle pattern. TIP: A fun gift idea is getting two pairs of socks (the same style). 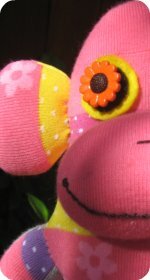 Make one pair into a monkey or other soft toy and keep the second pair as is. 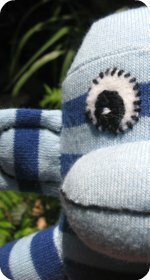 How fun having a pair of socks the same as your what your stuffed toys made from! !